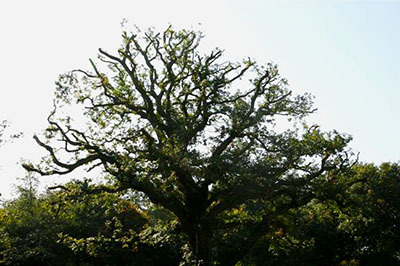 The practices of some tree services has given tree crown reduction a bad name. The fact is, the canopy of a tree can be successfully reduced without adverse affect to the tree or surrounding environment. However, if the tree is large and intrusive, you may want to consider other options, such as tree removal. The tree in the picture to the right has had about a 15% reduction in the over-all crown width and height. The reduction to the crown of this tree is within safe limits, however, the canopy may have been over thinned a bit. When this happens, the tree can be open to scalding by the sun's rays among other problems. One thing you should never do, when your tree or plant is already dealing with a problem, is over-prune or over-trim. Plants and trees move water and nutrients throughout their system continually. In order for plants and trees to have the energy they need for this task, they have to be able to convert light energy into chemical energy, for storage and use when needed. This is accomplished through a process known as photosynthesis, carried out particularly in the green leaf of the plant. In some plant species, over-pruning can disturb this process enough to cause irreparable damage to the plants abilty to defend it itself against an attack. This image to the left is an example of lion's tailing. Lion's tailing is a technique practiced, where most or all of the branches are stripped clean and the inside of the tree is completely open, leaving nothing but foliage at the ends. This technique also opens the tree to sunscald, upsets the natural balance and chemistry of the tree, as well as creating rapid unsitely new growth. At DelrayTreeService.com our technicians and affiliates are aborists with years of continued education and training in the proper methods of tree trimming and pruning. 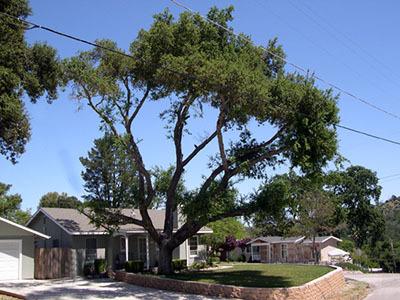 We are dedicated to the preservation of your trees and the aesthetics of your property, as well as the entire community.